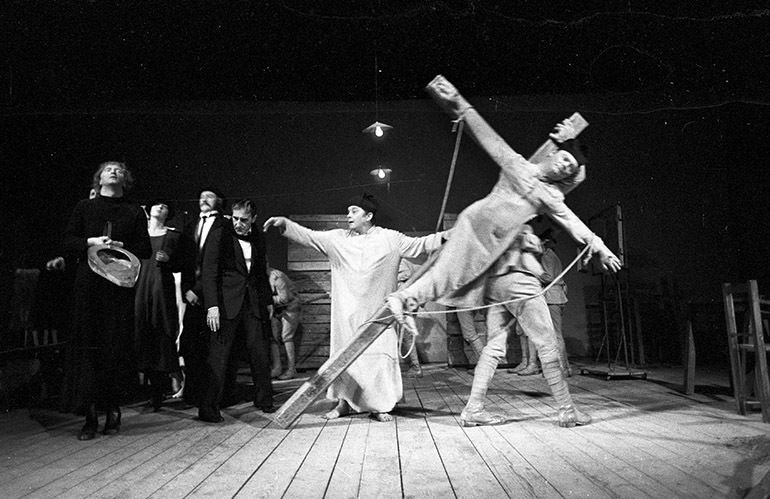 In the autumn of 1979 Tadeusz Kantor and his Cricot 2 theatre left for Florence, where the municipal authorities had proposed that he create a new play. The preparations had already partially begun at the Krzysztofory Gallery in Kraków. In Florence, the rehearsals took place at a deconsecrated church located in the Oltarno neighbourhood. After eight months of rehearsals the première was held on 23rd June, 1980. The poster for the play became famous. Tadeusz Kantor placed on this poster a black and white photograph from the beginning of the 20th century, showing the parish church in Wielopole Skrzyńskie, his hometown. The parish priest at this church was Kantor’s grandmother’s brother – Father Józef Radoniewicz. This is where the artist’s parents were married and he was baptised. He was born in the church’s presbytery, where he also spent the first six years of his life. It is not just the photograph of the church that plays a special role in this performance. In Wielopole, Wielopole a certain revival of photographs of World War I recruits takes place. Tadeusz Kantor’s father, Marian Kantor, participated in this war. The artist’s father sits in the first row both in a photograph and in this photograph’s living image created in the performance. A character called the local photographer’s widow lines up a family next to a priest’s corpse for a photo. At a certain moment she substitutes the daguerreotype camera she uses with a machine gun. She also washes the priest’s corpse. Kantor also evokes other memories from his childhood and the names of his family members, 'the dear absent ones': The play features Mother Helka, Father Marian, Uncle Józef – the Priest, Uncle Stasio – the Exile, Grandmother Katarzyna, Uncle Olek, Uncle Karol, Aunt Józka, Aunt Mańka and Adaś (a cousin). The Little Rabbi also appears – before World War II half of the inhabitants of Wielopole Skrzyńskie were Jewish. The action takes place in a 'Room of Imagination' in which various images from the family’s life, wartime memories and scenes referring to Christ’s passion overlap. The space of the room which contains such ordinary pieces of furniture as a bed or a closet is invaded by crosses and recruits coming straight from the war. In 1983 Kantor agreed to stage the performance once at the parish church in his hometown (which by then was a village). Wielopole, Wielopole was presented in Poland and during several of Cricot 2 theatre's foreign tours for a few more years, until 1989. This is a play (…) full of complex metaphors. This is also a proposition (…) in which all kinds of updates and clashes of stereotypes, myths and cultural imaginations are important. The combination of precision of form and greatness of content creates emotion. Emotion is the basis of true theatre.